As long as it's in tune, it's impossible to sound bad on this guitar. Worth every penny. Heavy. Not as fast as some. 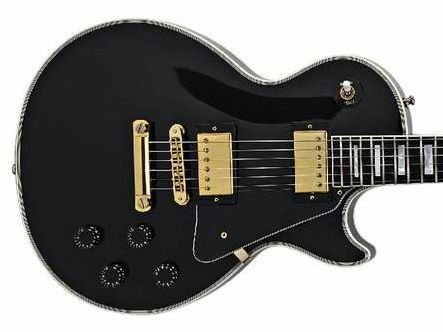 To change the format of the Les Paul would be as sacrilegious as cutting Slash's hair. Gibson hasn't. Now, as in the '50s, you'll find yourself sweating beneath a monster mahogany body, squeezing out riffs on a set mahogany neck. Gibson does stress this LP Custom doesn't have the historical appointments of the '50s original, but unless you're one of those weirdos who can date a guitar by looking at it, you'll neither notice nor care. Contrary to popular opinion, the Les Paul is not a perfect design. Pick this baby up and you'll notice it's vertebrae-bendingly heavy, less accommodating than modern shred axes and pretty expensive. If you're not a penny-pinching, pigeon-chested metaller though, this guitar is a slice of heaven. Strap up and you'll feel like Jimmy Page. Fret a note clean and it rings out like a buttery bell. Crank the overdrive and you'll bring in a fat swagger that sustains for decades. Pull out those bending blues licks and the audience will eat out of your hand.